Jörg Buttgereit's classic underground movie Nekromantik 2 celebrates its 25th anniversary. 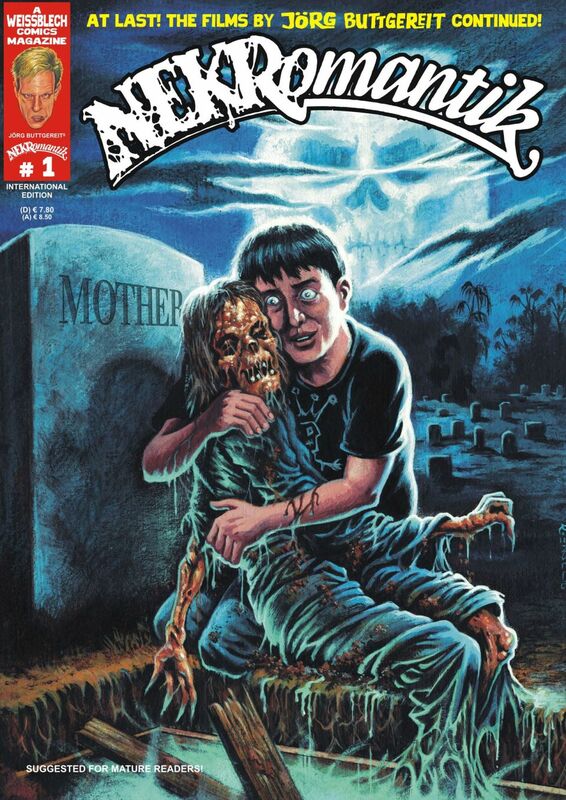 To celebrate, a comic book has been released continuing the world of Nekromantik. The book starts off with an introduction by the cult director Jörg Buttgereit who tells us how this book came about. Martin Trafford alongside the director have brought a new part of the Nekromantik world to life, in its stark black and white drawings contained within this 52 page long comic. Set 20 years after the events of Nekromantik 2 we see troubled gravedigger Eddie try to come to terms with his feelings for his girlfriend and his overbearing mother. Only through his love of the dead can he feel what he believes to be normal, but what he sees as normal others may see as undesirable. Page after page we Eddie's struggle with life and the dead but fans of the Nekromantik world will finally get an answer to the question: What became of Monika and her child? Highly recommend picking up a copy of this if you can especially if you are a fan of the Nekromantik films as this comic book contains hidden easter eggs for the most observant of fans. Not only do you get a fantastic continuation of Jörg's cult film to read but you also get an interview with Martin Trafford, and an abridged story of when Graham Rae met Jörg Buttgereit on the journey to the final resting place of Ed Gein. The comic book is available in its original native language and in an English international edition.